Chronic myelogenous leukemia (CML), also known as chronic myeloid leukemia, is a myeloproliferative disorder characterized by increased proliferation of the granulocytic cell line without the loss of their capacity to differentiate. It accounts for 20% of all leukemias affecting adults. See the image below. Blood film at 1000X magnification demonstrates the whole granulocytic lineage, including an eosinophil and a basophil. Courtesy of U. Woermann, MD, Division of Instructional Media, Institute for Medical Education, University of Bern, Switzerland. Chronic myelogenous leukemia (CML), also known as chronic myeloid leukemia, is a myeloproliferative disorder characterized by increased proliferation of the granulocytic cell line without the loss of their capacity to differentiate. 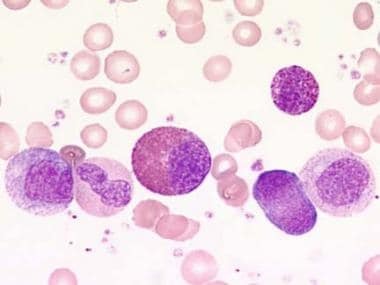 Consequently, the peripheral blood cell profile shows an increased number of granulocytes and their immature precursors, including occasional blast cells. CML is one of the few cancers known to be caused by a single, specific genetic mutation. More than 90% of cases result from a cytogenetic aberration known as the Philadelphia chromosome (see Pathophysiology). CML progresses through three phases: chronic, accelerated, and blast. In the chronic phase of disease, mature cells proliferate; in the accelerated phase, additional cytogenetic abnormalities occur; in the blast phase, immature cells rapidly proliferate. [1, 2] Approximately 85% of patients are diagnosed in the chronic phase and then progress to the accelerated and blast phases after 3-5 years. The diagnosis of CML is based on the histopathologic findings in the peripheral blood and the Philadelphia chromosome in bone marrow cells (see Workup). CML accounts for 20% of all leukemias affecting adults. It typically affects middle-aged individuals. Uncommonly, the disease occurs in younger individuals. Younger patients may present with a more aggressive form of CML, such as in accelerated phase or blast crisis. Uncommonly, CML may appear as a disease of new onset in elderly individuals. 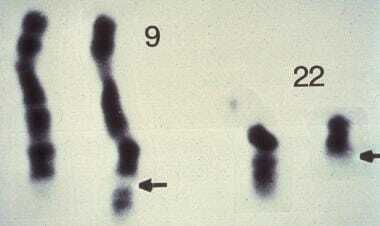 The Philadelphia chromosome, which is a diagnostic karyotypic abnormality for chronic myelogenous leukemia, is shown in this picture of the banded chromosomes 9 and 22. Shown is the result of the reciprocal translocation of 22q to the lower arm of 9 and 9q (c-abl to a specific breakpoint cluster region [bcr] of chromosome 22 indicated by the arrows). Courtesy of Peter C. Nowell, MD, Department of Pathology and Clinical Laboratory of the University of Pennsylvania School of Medicine. The presence of BCR/ABL rearrangement is the hallmark of CML, although this rearrangement has also been described in other diseases. It is considered diagnostic when present in a patient with clinical manifestations of CML. The initiating factor of CML is still unknown, but exposure to ionizing radiation has been implicated, as observed in the increased prevalence among survivors of the atomic bombing of Hiroshima and Nagasaki. Other agents, such as benzene, are possible causes. Historically, the median survival of patients with CML was 3-5 years from the time of diagnosis. Currently, patients with CML have a median survival of 5 or more years. The 5-year survival rate has doubled from 31% in the early 1990s to 63% for patients diagnosed from 2005 to 2011. The improvement has resulted from earlier diagnosis, improved therapy with targeted drugs and bone marrow transplantation, and better supportive care. As treatment improved, the need to stage patients according to their prognoses became necessary to justify procedures with high morbidity and mortality, such as bone marrow transplantation. Online calculators for the Sokal score are available. Some patients with molecular remissions from interferon alfa may be cured, but this can only be established over time. Patients who develop blast crisis, which has manifestations similar to those of acute leukemia, have a very poor prognosis. Treatment results are unsatisfactory, and most of these patients succumb to the disease. Survival is 3-6 months. The advent of TKI therapy has dramatically changed the overall survival in patients with CML. The recent update of patients both treated with IFN then shifted to Imatinib and those started on Imatinib alone was show to have an overall survival of 83.3% with a complete cytogenetic response rate of 82.8% (ref15). This study indicate that TKI in particular Imatinib is effective in inducing a long term survival close to the normal population without any long term adverse events. The social side effect of these form of tretment is the excessive cost at ~$100.000 annually at the time when the patent of the drug has expired but the advent of generic forms are being priced in the same expensive range with doubtful efficay. (ref61). Current studies are exploring criteria for discontinuation of these expensive drugs without affecting the optimal survival benefit of the drug on the long term to save cost for patients with CML(ref62). Current patient education information on CML is available on the the American Cancer Society and National Cancer Institute Web sites. For additional patient education information, see the Leukemia Directory. PDQ Adult Treatment Editorial Board. Chronic Myelogenous Leukemia Treatment (PDQ®): Health Professional Version. March 15, 2018. [Medline]. [Full Text]. Sawyers CL. Chronic myeloid leukemia. N Engl J Med. 1999 Apr 29. 340(17):1330-40. [Medline]. Druker BJ, Sawyers CL, Kantarjian H, et al. Activity of a specific inhibitor of the BCR-ABL tyrosine kinase in the blast crisis of chronic myeloid leukemia and acute lymphoblastic leukemia with the Philadelphia chromosome. N Engl J Med. 2001 Apr 5. 344(14):1038-42. [Medline]. [Full Text]. Kantarjian H, Sawyers C, Hochhaus A, et al, for the International STI571 CML Study Group. Hematologic and cytogenetic responses to imatinib mesylate in chronic myelogenous leukemia. N Engl J Med. 2002 Feb 28. 346(9):645-52. [Medline]. [Full Text]. Merx K, Muller MC, Kreil S, et al. Early reduction of BCR-ABL mRNA transcript levels predicts cytogenetic response in chronic phase CML patients treated with imatinib after failure of interferon alpha. Leukemia. 2002 Sep. 16(9):1579-83. [Medline]. [Full Text]. Talpaz M, Silver RT, Druker BJ, et al. Imatinib induces durable hematologic and cytogenetic responses in patients with accelerated phase chronic myeloid leukemia: results of a phase 2 study. Blood. 2002 Mar 15. 99(6):1928-37. [Medline]. [Full Text]. Kantarjian HM, Cortes JE, O'Brien S, et al. Imatinib mesylate therapy in newly diagnosed patients with Philadelphia chromosome-positive chronic myelogenous leukemia: high incidence of early complete and major cytogenetic responses. Blood. 2003 Jan 1. 101(1):97-100. [Medline]. [Full Text]. Shah NP, Tran C, Lee FY, et al. Overriding imatinib resistance with a novel ABL kinase inhibitor. Science. 2004 Jul 16. 305(5682):399-401. [Medline]. Volpe G, Panuzzo C, Ulisciani S, Cilloni D. Imatinib resistance in CML. Cancer Lett. 2009 Feb 8. 274(1):1-9. [Medline]. Faderl S, Talpaz M, Estrov Z, O'Brien S, Kurzrock R, Kantarjian HM. The biology of chronic myeloid leukemia. N Engl J Med. 1999 Jul 15. 341(3):164-72. [Medline]. Cancer Facts & Figures 2018. American Cancer Society. Available at https://www.cancer.org/content/dam/cancer-org/research/cancer-facts-and-statistics/annual-cancer-facts-and-figures/2018/cancer-facts-and-figures-2018.pdf. Accessed: January 10, 2018. Gambacorti-Passerini C, Antolini L, Mahon FX, Guilhot F, Deininger M al et. Multicenter independent assessment of outcomes in chronic myeloid leukemia patients treated with imatinib. J Natl Cancer Inst. 2011 Apr 6. 103(7):553-61. [Medline]. Wang W, Cortes JE, Tang G, Khoury JD, Wang S, Bueso-Ramos CE, et al. Risk stratification of chromosomal abnormalities in chronic myelogenous leukemia in the era of tyrosine kinase inhibitor therapy. Blood. 2016 Mar 22. [Medline]. PDQ Adult Treatment Editorial Board. Chronic Myelogenous Leukemia Treatment (PDQ®): Patient Version. 2002. [Medline]. [Full Text]. Hochhaus A, Larson RA, Guilhot F, Radich JP, Branford S, Hughes TP, et al. Long-Term Outcomes of Imatinib Treatment for Chronic Myeloid Leukemia. N Engl J Med. 2017 Mar 9. 376 (10):917-927. [Medline]. 'Imatinib Changed Everything': The Future Is Now More Hopeful. Medscape Medical News. Available at http://www.medscape.com/viewarticle/876942. March 9, 2017; Accessed: March 10, 2017. Islamagic E, Hasic A, Kurtovic S, et al. The Efficacy of Generic Imatinib as First- and Second-line Therapy: 3-Year Follow-up of Patients With Chronic Myeloid Leukemia. Clin Lymphoma Myeloma Leuk. 2017 Feb 16. [Full Text]. [Guideline] Radich JP, Deininger M, Abboud CN, Altman JK, Berman E, et al. Chronic Myeloid Leukemia, Version 1.2019, NCCN Clinical Practice Guidelines in Oncology. J Natl Compr Canc Netw. 2018 Sep. 16 (9):1108-1135. [Medline]. [Full Text]. Castellino AM. Stopping Drug Therapy for CML: EURO-SKI Results. Medscape Medical News. Available at http://www.medscape.com/viewarticle/872803. December 5, 2017; Accessed: March 10, 2017. Barrett AJ, Ito S. The role of stem cell transplantation for chronic myelogenous leukemia in the 21st century. Blood. 2015 May 21. 125 (21):3230-5. [Medline]. Druker BJ, Talpaz M, Resta DJ, et al. Efficacy and safety of a specific inhibitor of the BCR-ABL tyrosine kinase in chronic myeloid leukemia. N Engl J Med. 2001 Apr 5. 344(14):1031-7. [Medline]. [Full Text]. Goldman JM, Druker BJ. Chronic myeloid leukemia: current treatment options. Blood. 2001 Oct 1. 98(7):2039-42. [Medline]. [Full Text]. Santos FP, Alvarado Y, Kantarjian H, Verma D, O'Brien S, Mattiuzzi G, et al. Long-term prognostic impact of the use of erythropoietic-stimulating agents in patients with chronic myeloid leukemia in chronic phase treated with imatinib. Cancer. 2011 Mar 1. 117(5):982-91. [Medline]. Sawyers CL, Hochhaus A, Feldman E, et al. Imatinib induces hematologic and cytogenetic responses in patients with chronic myelogenous leukemia in myeloid blast crisis: results of a phase II study. Blood. 2002 May 15. 99(10):3530-9. [Medline]. Tang M, Gonen M, Quintas-Cardama A, et al. Dynamics of chronic myeloid leukemia response to long-term targeted therapy reveal treatment effects on leukemic stem cells. Blood. 2011 Aug 11. 118(6):1622-31. [Medline]. Ibrahim AR, Eliasson L, Apperley JF, Milojkovic D, Bua M, Szydlo R, et al. Poor adherence is the main reason for loss of CCyR and imatinib failure for chronic myeloid leukemia patients on long-term therapy. Blood. 2011 Apr 7. 117(14):3733-6. [Medline]. Hochhaus A, Kreil S, Corbin AS, La Rosée P, Müller MC, Lahaye T, et al. Molecular and chromosomal mechanisms of resistance to imatinib (STI571) therapy. Leukemia. 2002 Nov. 16(11):2190-6. [Medline]. [Guideline] Baccarani M, Pileri S, Steegmann JL, Muller M, Soverini S, Dreyling M, et al. Chronic myeloid leukemia: ESMO Clinical Practice Guidelines for diagnosis, treatment and follow-up. Ann Oncol. 2012 Oct. 23 Suppl 7:vii72-7. [Medline]. [Full Text]. Marcolino MS, Boersma E, Clementino NC, et al. Imatinib treatment duration is related to decreased estimated glomerular filtration rate in chronic myeloid leukemia patients. Ann Oncol. 2011 Sep. 22(9):2073-9. [Medline]. FDA Approval for Dasatinib. National Cancer Institute. Available at http://www.cancer.gov/cancertopics/druginfo/fda-dasatinib. Accessed: October 8, 2015. FDA Approval for Nilotinib. National Cancer Institute. Available at http://www.cancer.gov/cancertopics/druginfo/fda-nilotinib. Accessed: October 8, 2015. Bosulif (bosutinib) [package insert]. New York, NY: Pfizer, Inc. April 2016. Available at [Full Text]. Jabbour E, Kantarjian H, O'Brien S, et al. The achievement of an early complete cytogenetic response is a major determinant for outcome in patients with early chronic phase chronic myeloid leukemia treated with tyrosine kinase inhibitors. Blood. 2011 Oct 27. 118(17):4541-6; quiz 4759. [Medline]. Hughes TP, Hochhaus A, Branford S, Müller MC, Kaeda JS, Foroni L, et al. Long-term prognostic significance of early molecular response to imatinib in newly diagnosed chronic myeloid leukemia: an analysis from the International Randomized Study of Interferon and STI571 (IRIS). Blood. 2010 Nov 11. 116(19):3758-65. [Medline]. FDA. Sprycel (dasatinib): Drug Safety Communication – Risk of Pulmonary Arterial Hypertension. US Food and Drug Administration. Available at http://www.fda.gov/Safety/MedWatch/SafetyInformation/SafetyAlertsforHumanMedicalProducts/ucm275176.htm. Accessed: October 8, 2015. Sawyers CL. Even better kinase inhibitors for chronic myeloid leukemia. N Engl J Med. 2010 Jun 17. 362(24):2314-5. [Medline]. Jabbour E, Kantarjian H, O'Brien S, Shan J, Garcia-Manero G, Wierda W, et al. Predictive factors for outcome and response in patients treated with second generation tyrosine kinase inhibitors for chronic myeloid leukemia in chronic phase post imatinib failure. Blood. 2010 Oct 28. [Medline]. Verma D, Kantarjian H, Strom SS, et al. Malignancies occurring during therapy with tyrosine kinase inhibitors (TKIs) for chronic myeloid leukemia (CML) and other hematologic malignancies. Blood. 2011 Oct 20. 118(16):4353-8. [Medline]. Kantarjian H, Shah NP, Hochhaus A, Cortes J, Shah S, Ayala M, et al. Dasatinib versus imatinib in newly diagnosed chronic-phase chronic myeloid leukemia. N Engl J Med. 2010 Jun 17. 362(24):2260-70. [Medline]. Cortes JE, Jones D, O'Brien S, Jabbour E, Ravandi F, Koller C, et al. Results of dasatinib therapy in patients with early chronic-phase chronic myeloid leukemia. J Clin Oncol. 2010 Jan 20. 28(3):398-404. [Medline]. [Full Text]. Mulcahy N. FDA updates dasatinib label for chronic myeloid leukemia. Medscape Medical News. June 26, 2013. [Full Text]. Jabbour E, Kantarjian HM, Saglio G, Steegmann JL, Shah NP, Boqué C, et al. Early response with dasatinib or imatinib in chronic myeloid leukemia: 3-year follow-up from a randomized phase 3 trial (DASISION). Blood. 2014 Jan 23. 123 (4):494-500. [Medline]. [Full Text]. Shah NP, Guilhot F, Cortes JE, Schiffer CA, le Coutre P, Brümmendorf TH, et al. Long-term outcome with dasatinib after imatinib failure in chronic-phase chronic myeloid leukemia: follow-up of phase 3 study. Blood. 2014 Feb 25. [Medline]. Saglio G, Kim DW, Issaragrisil S, le Coutre P, Etienne G, Lobo C, et al. Nilotinib versus imatinib for newly diagnosed chronic myeloid leukemia. N Engl J Med. 2010 Jun 17. 362(24):2251-9. [Medline]. Kantarjian HM, Hochhaus A, Saglio G, et al. Nilotinib versus imatinib for the treatment of patients with newly diagnosed chronic phase, Philadelphia chromosome-positive, chronic myeloid leukaemia: 24-month minimum follow-up of the phase 3 randomised ENESTnd trial. Lancet Oncol. 2011 Sep. 12(9):841-51. [Medline]. Tasigna (nilotinib) [package insert]. East Hanover, New Jersey 07936: Novartis Pharmaceuticals Corporation. March 2018. Available at [Full Text]. Khoury HJ, Cortes JE, Kantarjian HM, Gambacorti-Passerini C, Baccarani M, Kim DW, et al. Bosutinib is active in chronic phase chronic myeloid leukemia after imatinib and dasatinib and/or nilotinib therapy failure. Blood. 2012 Apr 12. 119(15):3403-12. [Medline]. Cortes JE, Gambacorti-Passerini C, Deininger MW, Mauro MJ, Chuah C, Kim DW, et al. Bosutinib Versus Imatinib for Newly Diagnosed Chronic Myeloid Leukemia: Results From the Randomized BFORE Trial. J Clin Oncol. 2017 Nov 1. JCO2017747162. [Medline]. [Full Text]. Chustecka Z. FDA Approves Ponatinib for Rare Leukemias. Medscape Medical News. December 14, 2012. [Full Text]. Cortes JE, Kantarjian H, Shah NP, Bixby D, Mauro MJ, Flinn I, et al. Ponatinib in refractory Philadelphia chromosome-positive leukemias. N Engl J Med. 2012 Nov 29. 367(22):2075-88. [Medline]. Cortes JE, Kim DW, Pinilla-Ibarz J, le Coutre P, Paquette R, et al. A phase 2 trial of ponatinib in Philadelphia chromosome-positive leukemias. N Engl J Med. 2013 Nov 7. 369 (19):1783-96. [Medline]. Mulahy N. Leukemia Drug Ponatinib (Iclusig) Pulled From Market. Medscape Medical News. Available at http://www.medscape.com/viewarticle/813531. Accessed: October 8, 2015. FDA Drug Safety Communication. FDA asks manufacturer of the leukemia drug Iclusig (ponatinib) to suspend marketing and sales. US Food and Drug Administration. Available at http://www.fda.gov/Drugs/DrugSafety/ucm373040.htm. Accessed: October 8, 2015. Nelson R. Ponatinib (Iclusig) Returns to Market, With a Few Caveats. Medscape Medical News. Available at http://www.medscape.com/viewarticle/818183?src=wnl_edit_specol&uac=72886PK. Accessed: October 8, 2015. FDA Drug Safety Communication: FDA requires multiple new safety measures for leukemia drug Iclusig; company expected to resume marketing. US Food and Drug Administration. Available at http://www.fda.gov/Drugs/DrugSafety/ucm379554.htm. Accessed: October 8, 2015. Synribo (omacetaxine) [package insert]. North Wales, PA: Teva Pharmaceuticals USA, Inc. October, 2012. Available at [Full Text]. Simonsson B, Gedde-Dahl T, Markevarn B, et al. Combination of pegylated IFN-a2b with imatinib increases molecular response rates in patients with low- or intermediate-risk chronic myeloid leukemia. Blood. 2011 Sep 22. 118(12):3228-35. [Medline]. Moreb J, Johnson T, Kubilis P, Myers L, Oblon D, Miller A, et al. Improved survival of patients with chronic myelogenous leukemia undergoing allogeneic bone marrow transplantation. Am J Hematol. 1995 Dec. 50(4):304-6. [Medline]. McGlave PB, Beatty P, Ash R, Hows JM. Therapy for chronic myelogenous leukemia with unrelated donor bone marrow transplantation: results in 102 cases. Blood. 1990 Apr 15. 75(8):1728-32. [Medline]. Deininger M, Schleuning M, Greinix H, Sayer HG, Fischer T, Martinez J, et al. The effect of prior exposure to imatinib on transplant-related mortality. Haematologica. 2006 Apr. 91(4):452-9. [Medline]. Lima L, Bernal-Mizrachi L, Saxe D, Mann KP, Tighiouart M, Arellano M, et al. Peripheral blood monitoring of chronic myeloid leukemia during treatment with imatinib, second-line agents, and beyond. Cancer. 2011 Mar 15. 117(6):1245-52. [Medline]. Baccarani M, Saglio G, Goldman J, Hochhaus A, Simonsson B, Appelbaum F, et al. Evolving concepts in the management of chronic myeloid leukemia: recommendations from an expert panel on behalf of the European LeukemiaNet. Blood. 2006 Sep 15. 108 (6):1809-20. [Medline]. [Full Text]. Branford S, Rudzki Z, Harper A, Grigg A, Taylor K, Durrant S, et al. Imatinib produces significantly superior molecular responses compared to interferon alfa plus cytarabine in patients with newly diagnosed chronic myeloid leukemia in chronic phase. Leukemia. 2003 Dec. 17 (12):2401-9. [Medline]. Cortes J, Talpaz M, O'Brien S, Jones D, Luthra R, Shan J, et al. Molecular responses in patients with chronic myelogenous leukemia in chronic phase treated with imatinib mesylate. Clin Cancer Res. 2005 May 1. 11 (9):3425-32. [Medline]. [Full Text]. Branford S, Rudzki Z, Walsh S, Parkinson I, Grigg A, Szer J, et al. Detection of BCR-ABL mutations in patients with CML treated with imatinib is virtually always accompanied by clinical resistance, and mutations in the ATP phosphate-binding loop (P-loop) are associated with a poor prognosis. Blood. 2003 Jul 1. 102 (1):276-83. [Medline]. [Full Text]. Press RD, Galderisi C, Yang R, Rempfer C, Willis SG, Mauro MJ, et al. A half-log increase in BCR-ABL RNA predicts a higher risk of relapse in patients with chronic myeloid leukemia with an imatinib-induced complete cytogenetic response. Clin Cancer Res. 2007 Oct 15. 13 (20):6136-43. [Medline]. [Full Text]. Saglio G, Sharf G, Almeida A, Bogdanovic A, Bombaci F, Čugurović J, et al. Considerations for Treatment-free Remission in Patients With Chronic Myeloid Leukemia: A Joint Patient-Physician Perspective. Clin Lymphoma Myeloma Leuk. 2018 Jun. 18 (6):375-379. [Medline]. [Full Text]. Saussele S, et al; EURO-SKI investigators. Discontinuation of tyrosine kinase inhibitor therapy in chronic myeloid leukaemia (EURO-SKI): a prespecified interim analysis of a prospective, multicentre, non-randomised, trial. Lancet Oncol. 2018 Jun. 19 (6):747-757. [Medline]. Sweet K, Oehler V. Discontinuation of tyrosine kinase inhibitors in chronic myeloid leukemia: when is this a safe option to consider?. Hematology Am Soc Hematol Educ Program. 2013. 2013:184-8. [Medline]. [Full Text]. [Guideline] Baccarani M, Deininger MW, Rosti G, et al. European LeukemiaNet recommendations for the management of chronic myeloid leukemia: 2013. Blood. 2013 Aug 8. 122 (6):872-84. [Medline]. [Full Text]. Blood film at 400X magnification demonstrates leukocytosis with the presence of precursor cells of the myeloid lineage. In addition, basophilia, eosinophilia, and thrombocytosis can be seen. Courtesy of U. Woermann, MD, Division of Instructional Media, Institute for Medical Education, University of Bern, Switzerland. Blood film at 1000X magnification shows a promyelocyte, an eosinophil, and 3 basophils. Courtesy of U. Woermann, MD, Division of Instructional Media, Institute for Medical Education, University of Bern, Switzerland. Bone marrow film at 400X magnification demonstrates clear dominance of granulopoiesis. The number of eosinophils and megakaryocytes is increased. Courtesy of U. Woermann, MD, Division of Instructional Media, Institute for Medical Education, University of Bern, Switzerland. Fluorescence in situ hybridization using unique-sequence, double-fusion DNA probes for bcr (22q11.2) in red and c-abl (9q34) gene regions in green. The abnormal bcr/abl fusion present in Philadelphia chromosome–positive cells is in yellow (right panel) compared with a control (left panel). Courtesy of Emmanuel C. Besa, MD.